Sugar free muffins are easy to make and great to store. Sealed in an airtight container, they will keep for a few days, making them ideal for packed lunches or snacks. Served cold, they make a great accompaniment to a cup of tea, and served warm, they can be delicious puddings. They also work well when served with cream or sugar free ice-cream or custard. There are a number of ways of making muffins without using sugar. Honey, fruit, jam or granulated sweetener can all be used. Here are just a few examples of what is, in fact, a very versatile recipe. An American favourite, blueberry muffins are also now extremely popular in the UK and other European countries. The soft fruit contrasts beautifully with the light sponge. This recipe calls for honey as a sweetener. Preheat your oven to 200 deg C/400 deg F/gas mark six. Melt your butter and honey in a small pan over a low heat. Sieve your flour and baking powder into a large bowl and stir in your warm liquid. Beat your eggs then stir them in. Very gently fold your blueberries into the mixture. Take your muffin cases and place a generous spoonful of your mixture into each one. Then bake for about 20 minutes until risen and golden on top. Sugar free banana muffins are delicious when newly baked and served fresh from the oven. Try them when drizzled with hot sugar free custard. Preheat your oven to 200 deg C/400 deg F/gas mark six. Peel your ripe bananas and mash them in a large bowl. In a smaller bowl, beat your eggs. Stir the eggs and milk into the bananas. Puree with a hand blender. Sieve your flour, bicarbonate of soda and baking powder, and fold into the batter. Spoon a generous amount of the mixture into each muffin case. Bake for 20 minutes, until risen and golden brown. These sugar free banana muffins are delicious when served with fresh cream. A delicious summer recipe, these sugar free muffins are scrumptious. They are best served with fresh cream or even sugar free ice-cream. Those who do not like strawberries can simply leave them out of the recipe. Preheat your oven to 200 deg C/400 deg F/gas mark six. Cream your butter and granulated sweetener in a large bowl. Beat your eggs separately, then mix them in. Wash and hull your strawberries. Chop into quarters and add to the mixture. Sieve your flour and baking powder, and stir in. 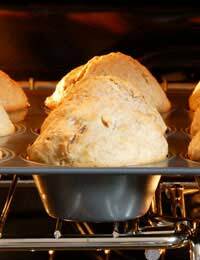 Place a generous spoonful of your mixture into each muffin case and bake for about 20 minutes until risen and golden on top.